A woodland scene with trees by a riverbank in summer. The kit has a large scale black and white chart printed 10 stitches to one inch on two A3 sheets with separate key. 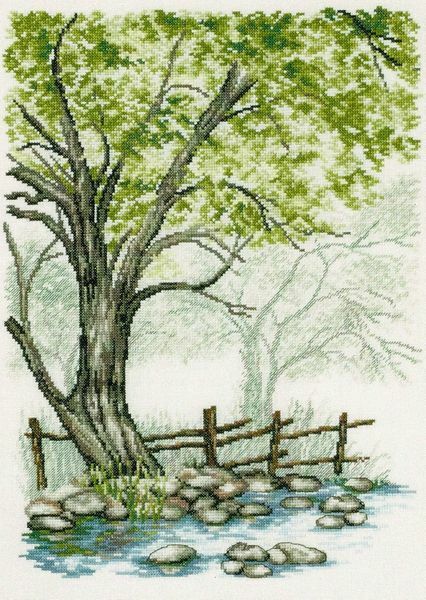 The pattern is worked in whole cross stitch, half cross stitch and a little backstitch around the rocks using 20 shades of stranded cottons on a stitch count of 170 by 220. The cross stitch is worked in two strands, the backstitch and half cross stitch in one strand over two fabric threads in linen and over one block in Aida.